While NASA’s Opportunity Mars rover remains silent, the skies of Mars are clear enough for the rover to be spotted from orbit. 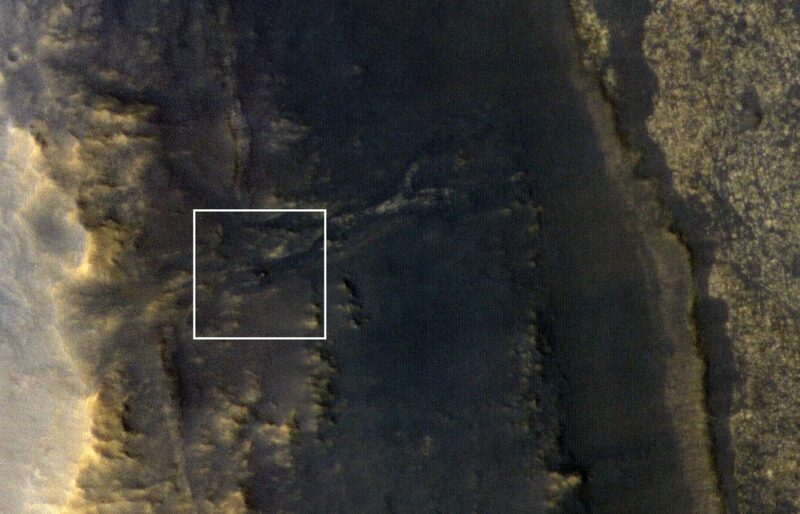 A new image from the Mars Reconnaissance Orbiter’s (MRO)HiRISE camera shows Opportunity on the slopes of Perseverance Valley. Opportunity was descending into the valley, when a dust storm swept over the area a little more the 100 days ago. The storm was one several that stirred up dust across the Red Planet, blocking sunlight from reaching the surface. Unable to generated sufficient power with its solar cells, Opportunity went into hibernation. At some points during the dust storm, the tau, a measurement of how much sunlight reaches the surface, over Opportunity was estimated to be slightly higher than 10. On Thursday, September 20, the Tau was estimated to be approximately 1.3 by MRO’s Mars Color Imager (MARCI) camera. The means that about 25 percent of the direct sunlight is now reaching the surface. The Opportunity mission team at NASA’s Jet Propulsion Laboratory (JPL) hasn’t heard from the rover since June 10. In recent weeks the dust has begun to clear. On September 11, JPL began increasing the frequency of commands it beams to the rover. Scientists don’t know how much dust has fallen on Opportunity’s solar arrays. The HiRISE image shows some reddening of the surrounding area, suggesting dust fallout, but it is not possible to determine how much dust is on the arrays. As the Red Planet’s dusty skies continue to clear, JPL will continue to send frequent commands and imaging will be repeated.